This is another of the girls at a different stall. In this photo you can see her Kim Il Sung badge. You can see how much our North Korean guide was enjoying himself in this one. They usually wear jackets as well but it got warm in the afternoon sun. 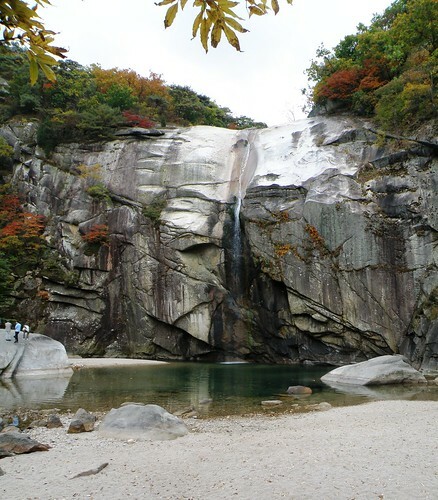 I tried to get a photo of Barkyeon waterfall with people in it to give everybody an idea of it’s actual size. The foliage around the waterfall is much more interesting than the waterfall itself to be honest. 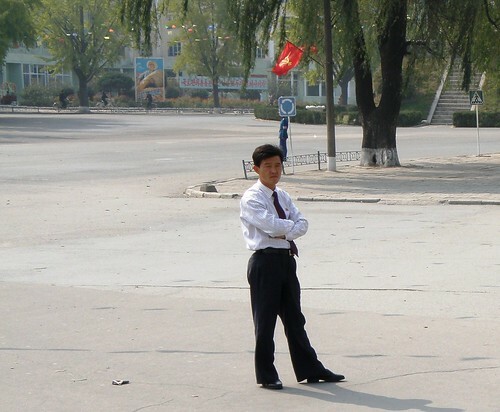 This is one of the main streets of Kaesong. You can see that they definitely haven’t cleared the streets of locals while the tours are passing through. They do keep a close eye on them at all times however to make sure they don’t get too close.